I was a huge nerd, and didn’t care about sports. Still, I watched the Green Bay Packers play every Sunday, because that’s what we did in my house. I just usually had a book open at the same time. Because of that ritual, the sound of a football game on TV is cathartic for me. I’d rather turn on the NFL Network than listen to a white noise app when I want to get work done. That’s why I’ll still tune into Super Bowl LII — even without cable. I enjoy the connection to the rest of the nation — while knocking out a blog post and making headway through a novel. And eating nachos, of course. If you’re in the same boat, use the day to make some extra money. Just make sure you take a break and tune in for the Halftime Show, so you know what everyone’s talking about on Facebook on Monday. While your family or roommates gather ‘round the TV this weekend, try some of these ways to make extra money. If you haven’t already signed up as a driver with Lyft, now’s a good time to do it. As a driver with Lyft, you can help Super Bowl party goers in your city safely get where they’re going and where they’re coming from. No driving drunk or walking in the cold! Plus, the higher demand before and after the game could mean a busy night and big bucks for you. You keep a portion of everything you earn as a driver, plus 100% of your tips. 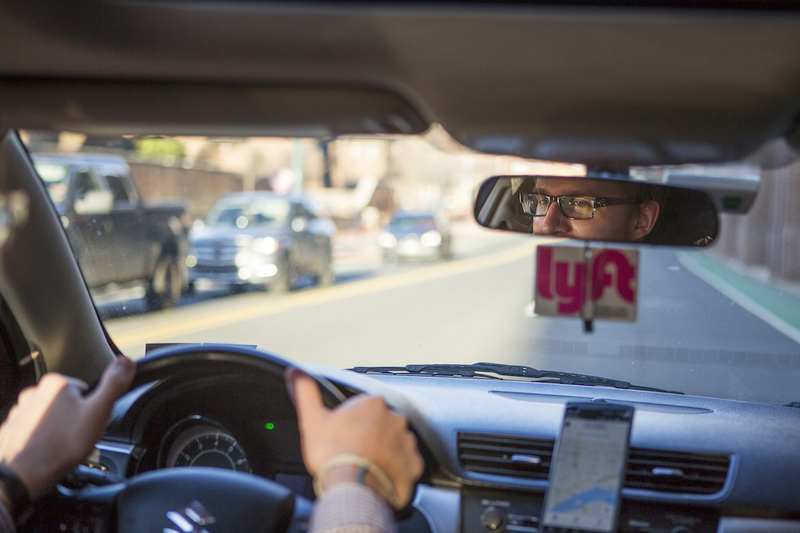 High Lyft traffic means “peak hours,” which might mean more money for you. Here’s a link to apply to drive with Lyft. Sports betting is probably the first thing to come to mind if you’re thinking about making extra money off the Super Bowl. If you don’t want to make a trip to Vegas to place a legal bet, you can do it online. I’m no sports betting expert (shocker), so I’ll share some of the basics from SportsBookReview.com. If you’re just checking in with what’s going on in the NFL, you probably don’t want to bet big! Maybe just dip your toe in this year, and see how you like it. Of course, gambling isn’t a sound way to earn money. If you enjoy the thrill of winning and can afford to lose, spend your money as you wish. But if you want to guarantee you come out ahead, use your spare cash and time to do something you know will earn money. First of all, if you’re not already using Ibotta on your everyday purchases, you’re doing it wrong. This app is a super simple way to earn cash-back rebates on items you already buy on the regular — everything from cereal and toilet paper to fresh produce. And it goes way beyond groceries. You guessed it: Booze is no exception. All you do is find a rebate at a grocery or liquor store, make your purchase, and then take a photo of your receipt within the app. Once you accumulate $20, you can transfer your earnings to your PayPal account. And considering rebates on alcoholic beverages are usually between $1 and $3 (plus the countless rebates available), it shouldn’t take you terribly long to get there! People dressed in their favorite team’s jersey and faces painted in celebration make for great photographs. Take advantage of the crowds of fans in your town to get some candid shots you can sell to stock photo sites. Note: Building owners or managers reserve the right to ask you not to take photos on their property. Otherwise, snap away, and make sure you understand whether your intended use of the photograph will require a model or property release. Want to hang out with the nerdy kids like me, who don’t want to pay attention to the game? Offer to take them off their parents’ hands for the day. Make game day easier for family and friends by offering to watch the little ones while they go out. You’ll get to make $20 to $40 and skip the loud parties. Check out a site like Care.com to make yourself easy to find ahead of game day. Pick up pet-sitting or dog-walking work to relieve football fans from the need to look after pets during time-outs. Just stopping by to feed or walk a dog could earn you up to $40 an hour. If you can’t find pet-sitting gigs in your network, hop on DogVacay to connect with pet owners in your area. Holidays — even faux holidays — are great for side hustlers. Unless you want to chat with your clients about football, your inbox and social media will probably be quiet on Super Bowl Sunday. Take advantage of the radio silence to get some work done. If you’re a freelance writer, pitch to these seven sites that pay $100 or more per post. And sign up for this free workshop from Proofread Anywhere to learn how to become a professional proofreader. Or, pick a passion project off the back burner. Work on a novel. Put the finishing touches on a painting. Format an ebook. If you’re just kicking off your side hustle in 2018, read our guide to getting started as a freelancer. If you haven’t, sign up for Amazon’s Mechanical Turk and create an account with TaskRabbit. The work differs quite a bit between these sites, but the strategy for earning money is similar: Find gigs you can complete quickly that pay well for the amount of time you put in. With a lot of Taskers and Turkers likely taking the day off, Super Bowl Sunday could be a great opportunity to get some of the best gigs. Most of you know surveys aren’t our favorite way to make extra money, but if you’re enjoying the soothing NFL commentary in the background, why not click a few buttons and make money while you do it? Ipsos Panel and Opinion Outpost are some of our favorite paid survey sites. What’s so special about this one? It pays users in cold, hard cash instead of rewards points. It’ll pay you for a variety of activities, including taking surveys, watching videos, playing games and shopping online.